This best practice example describes how to create supplier invoices in Fortnox. All Fortnox accounts will have two (2) GB free storage area that can be used to connect images to most records in Fortnox, e.g. vouchers, supplier invoices, articles and assets. If you have an image of the supplier invoice, we recommend that you always upload this and connect it to the supplier invoice in Fortnox. This creates a high user value in the software. By connecting an image to a supplier invoice our users will be able to see it both when reviewing the supplier invoice and in some reports, e.g the performance report. The resource “Supplier Invoices” requires that you have the scope for supplier invoices enabled. Supplier invoices in Fortnox supports both foreign and domestic currencies. When using a foreign currency you’ve got the ability to provide a currency rate against the domestic currency. If no currency rate is provided Fortnox will automatically fill in the exchange rate. The resource “Suppliers” requires that you have the scope for suppliers enabled. Before creating a supplier invoice you need to create the supplier that the invoice is from. You can choose if you want to set a supplier number yourself or if you want Fortnox to use the internal number series for suppliers. Address, payment and bookkeeping information is stored by the supplier resource. In the payment information you can provide information about the recipient’s bank account. For Swedish domestic payments, Bankgiro and Plusgiro and account number can be used, for international payments only Iban with Bic code. The resource “Supplier Invoice Accruals” requires that you have the scope for suppliers invoices enabled. Accruals on supplier invoices is supported by Fortnox, however this is not a mandatory function. Many users appreciate that they can use accruals on certain invoices. Accruals means that you can divide the cost of a supplier invoice between different months. For example, if you have a rental cost for three month on a single supplier invoice, you can divide the cost on three months by using accruals. 1. Is this a new supplier? First of all you need to decide if this is a new supplier or not. A simple way of doing this is to see if the supplier exists by searching for email, name or organisation number. To create a new supplier you only need to provide a name, but we recommend that you have this as a standard. You can also choose to provide a supplier number, if no supplier number is provided the next available in the number series will be used. Verify that the supplier already exists by retrieving it by using it’s SupplierNumber. If the supplier exists, proceed to step 2. If the supplier didn’t exist, create it by following the step 1.1. The accounts that you use needs to exist in Fortnox and be active. By checking this prior to creating the supplier invoice, you save yourself a few error messages. If the account exists, proceed to step 3. If the account didn’t exist, create it by following the step 2.1. Repeat the same process as you did with accounts, for both the cost centers and the projects! When validation has been made for the accounts, the cost centers and the projects, you’re ready to create the supplier invoice. To create accruals for a supplier invoices you need to use the resource “SupplierInvoiceAccruals” after you’ve created the invoice. If you only intend to use one cost account and not using any cost center or project, you can make a simple request without rows. If you only intend to use several cost account and using any cost center or project, you can make a request with rows. To connect an image to the supplier invoice, you first need to upload it to Fortnox. The file should be sent as a data stream. 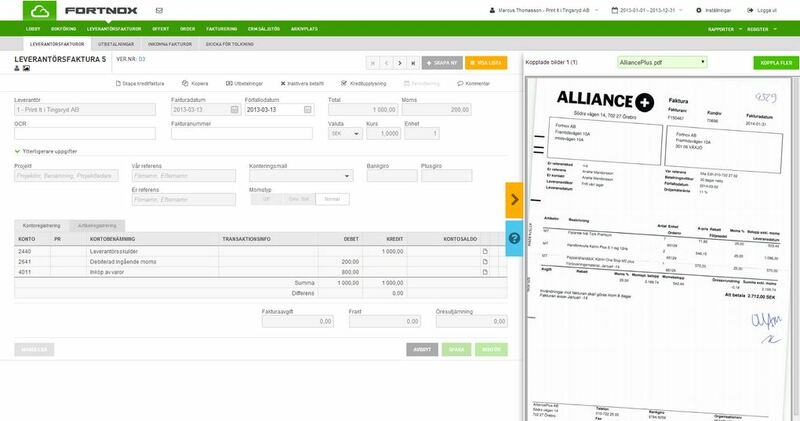 The final step for the supplier invoice is to bookkeep it, after that it can be payed and a voucher appears in the accounting module. If supplier invoice approval is active, you can’t bookkeep the supplier invoice before it has been approved. The bookkept supplier invoice will be returned.